40 Watt | AC-DC Converter By Aimtec Inc. This is one package pinout of AME40-MAZ,If you need more pinouts please download AME40-MAZ's pdf datasheet. 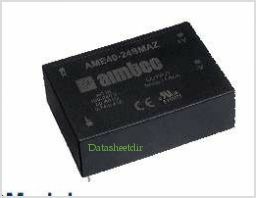 AME40-MAZ circuits will be updated soon..., now you can download the pdf datasheet to check the circuits! SPU25A, 25W Desk Top Switching Power Supplies For I.T.E.